Back in January of this year, Naked City Brewery & Taphouse celebrated their 10th Anniversary with parties, music and new beer releases at both their Greenwood and Camano Island locations. Now, Naked City is keeping the celebration going with even more parties, more music, more new beer releases and the announcement of a new Mug Club at their Greenwood location. All of the events are free and family friendly (open to all ages). Have you ever been a member of a craft brewery mug club? If you find that you’re a frequent visitor to some craft breweries more than others, joining a mug club could be a good way for you to save some money over time and even get access to special events and special releases. I myself have been a member of the mug club at Two Beers Brewing Company (CBM Sponsor) for several years now. Since they’re one of the breweries closest to my house, I tend to stop there quite a bit. Now, with Spring upon us, Two Beers Brewing has announced the annual renewal for their mug club memberships. As with most mug clubs, not every member renews their membership each year. Any un-renewed membership slots are then available for new members to join. If you are already a member and are renewing your membership, there may be a few benefits for you as well. The location of a craft brewery can sometimes influence how often you might visit. If a brewery you enjoy is further away from you, then you have to decide if the quality of the beer and the atmosphere of the establishment are worth the extra time and effort. I’m chagrined to say that I don’t always take the time or make the effort I should to visit breweries that are a bit father from home (my unusual work schedule doesn’t help either). Don’t get me wrong though, I do plan the occasional day or even overnight trip to visit breweries that are a bit of a trek, including breweries in Bellingham, Spokane, Portland, Bend, etc. Naked City Brewery & Taphouse up in Seattle’s Greenwood neighborhood has been one of my local favorites for years but, unfortunately, I don’t take the time to head North to visit them as often as I should. When they opened their new Camano Island location back in April though, I made sure I took the time to head up for a visit. It’s a great location and, style-wise, not much different from their original location in Greenwood. Now with their 9th Anniversary approaching, Naked City has decided to celebrate at their Camano Island location with a new Fall food menu, some rare Naked City beers and a Mug Club. It takes a lot of courage, dedication and countless hours of hard work to turn a dream into reality. Two Beers Brewing Company (CBM Sponsor) and Seattle Cider Company founder, Joel VandenBrink, found the courage to follow his dream way back in 2007 and, this week, the next part of that dream comes alive. Two Beers’ first tiny tasting room opened in 2009 at their current location on Ohio Avenue South. With just 6 seats at the bar and four beers on tap, it wasn’t long before it was clear that an expansion was needed. So, in late 2011, Two Beers Brewing opened The Woods 2.0 (the first version of the taproom to officially sport ‘The Woods’ moniker). The new, larger space featured more taps, a 45 foot reclaimed wood bar top and a ‘woodsy’ tree line painted on the walls. 2015 is here and, along with it, comes yet another expansion for Two Beers Brewing Company (CBM Sponsor). Since their modest beginnings back in 2007, brewing just 100 barrels a year, Two Beers Brewing Company has continued to grow to meet the ever-increasing demand for their brews. 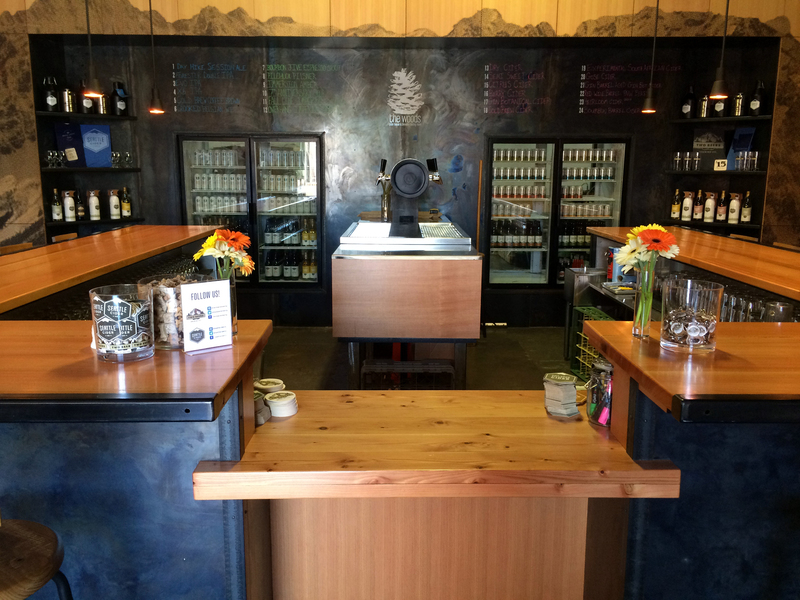 Also, since launching their incredibly popular sister company, Seattle Cider Company, in August 2013, the need for more space has become clear to anyone visiting The Woods (the shared taproom for Two Beers Brewing Company and Seattle Cider Company). Things can get pretty crowded these days, even on weeknights. In order to fulfill the demand for more space, The Woods will be moving. Don’t worry though. They’re only moving about 50 feet. Two Beers/Seattle Cider recently took over the space immediately to the North of their current location (the space formerly occupied by Resolute lighting). A larger tap room isn’t the only reason for the expansion. Two Beers Company and especially Seattle Cider Company have been growing so quickly, this expansion is an absolute must. When Seattle Cider Company first launched less than 2 years ago, they planed things out carefully and set a sales goal of how much cider they wanted to be selling within 5 years. To their astonishment, they reached that 5 year goal in just 6 months, which is pretty incredible. Two Beers Brewing Company (CBM Sponsor) has been quite a success story. From their humble beginnings back in 2007, brewing just 100 barrels a year, Two Beers Brewing has grown steadily and now brews nearly six thousand barrels of beer per year out of their brewery on Ohio Avenue South in Seattle’s SoDo neighborhood. ‘Officially’, according to their website, they brew twelve distinct beers, but that number jumps to more than twenty when you include all of their seasonals, casks and infusions. Two Beers Brewing Company is also one of those breweries that I can put on a very short and very special list: the list of breweries that, I can honestly say, don’t brew a single beer that I don’t like. Granted, not every one of their beers is my favorite, but every beer in their lineup is solid, brewed to style and a genuine pleasure to drink. 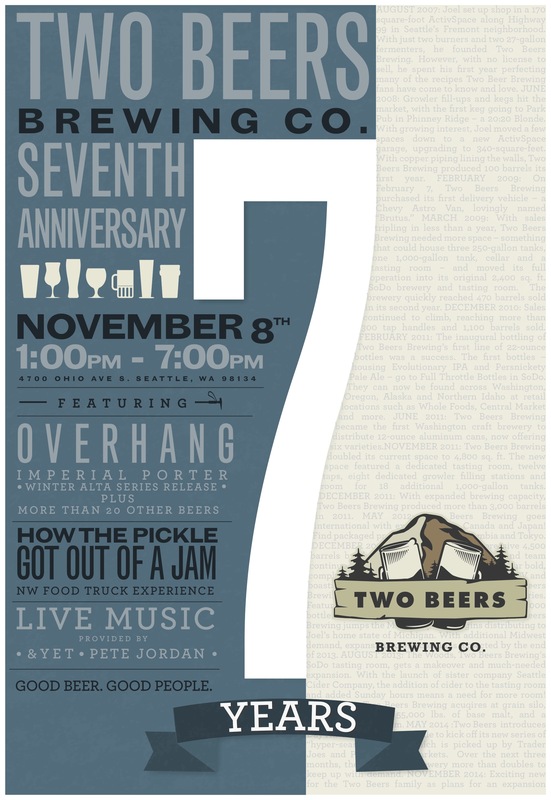 There will be a new addition to their ever-growing lineup as well, when Two Beers celebrates their 7th Anniversary on Saturday, November 8th. That date will mark both the return of Overhang Bourbon Imperial Porter from Two Beers’ Alta Series as well as the release of a special 7th Anniversary American Sour Ale. Both beers will be available on tap during the anniversary celebration and in bottles to go. A little over two years ago, in February of 2013, Two Beers Brewing Company (CBM Sponsor) released what was, ‘officially’, the first of their new Alta Series of beers: Switchback Russian Imperial Stout. 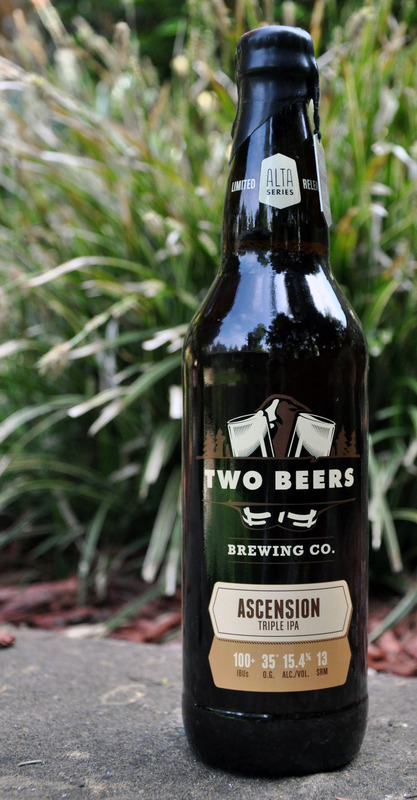 I say ‘officially’, because some lucky people got to try what would actually become the second beer in the Alta Series, Ascension Triple IPA, back at the 2012 Seattle International Beer Festival(SIBF)). The entire line up of Two Beers Brewing Company Alta Series of beers includes: Switchback Russian Imperial Stout (Later re-dubbed Fall Line Russian Imperial Stout), Ascension Triple IPA, High Divide Double Blonde and Overhang Imperial Porter. Early next month, on May 3rd, what is officially the second beer in the Alta Series, Ascension Triple IPA, returns for its second annual release (really its 3rd release overall, including the 2012 one-off appearance at the 2012 SIBF). 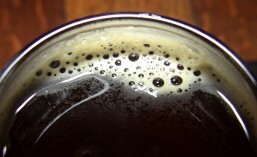 Do you enjoy beers from Black Raven Brewing Company? I know I sure do. Black Raven makes some truly delicious beers that rate high on my list, including: Wisdom Seeker Double IPA, Trickster IPA, La Petite Mort, Grandfather Raven Imperial Stout, Old Birdbrain Barleywine; the list goes on and on. I don’t get over to Redmond to visit Black Raven nearly as often as I’d like but, if you do, you might want to consider joining Ravenmasters – the Black Raven Brewing Company mug club. Mug club memberships are both a great way to show your loyalty to a particular brewery, as well as providing you with a wealth of benefits that save you money in the long run, and give you exclusive and/or early access to special offerings before the general public. I’m a member of the Two Beers Brewing Company (CBM Sponsor) mug club myself, since Two Beers is close to home for me, I visit there fairly often and the beers are delicious.